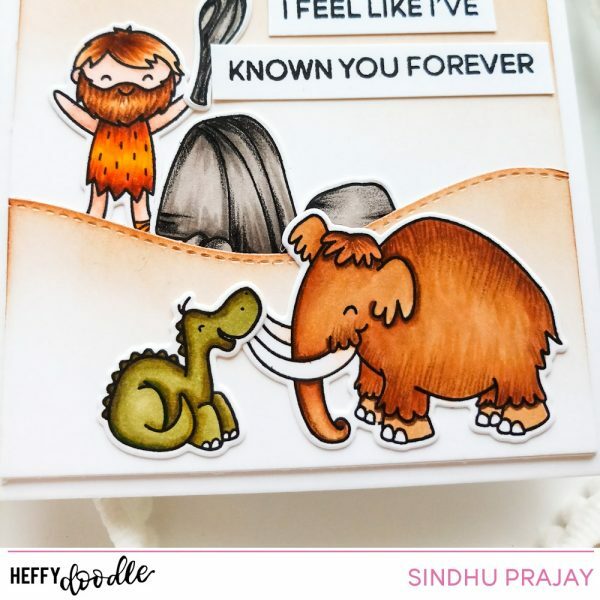 Sindhu here with a fun prehistoric scene card. I made this card keeping in mind some of my closest friends that I ‘met’ in the crafting world. We all have those friends that make us feel like we’ve known them forever even if we haven’t yet met them, right? I started by stamping the images from Prehistoric Pals stamp set. I coloured them using copic markers, added more details using pencils and used coordinating dies to cut the images out. I also die cut the slopes using the Stitched Slopey Joes border dies. I sponged the edges of the slopes with Distress Ink Vintage Photo. I adhered the slopes on a panel of white cardstock and then added the images playing around a bit to make sure they are positioned well. Then added the sentiment on strips of paper. I adhered the assembly on the card base. All that pre historic pictures are so cute. This is so adorable card.